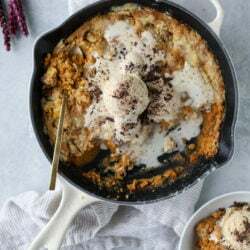 I’m taking your bourbon smash and raising it one level with pumpkin pie! Now the only thing better than this would be a huge slice of pie piled with bourbon infused whipped cream… with the cocktail. Pumpkin pie cocktail inception. So yes yes yes I KNOW that I’ve been absolutely insane over pumpkin this year, possibly to the point of annoyance, but this freaking cocktail. OH MY GOSH. It’s basically dessert, but not so sweet that your teeth hurt or that it ruins your dinner. It starts with this homemade pumpkin pie syrup. PIE SYRUP. Let’s make it a thing. I used this in my pumpkin coconut hot chocolate a few weeks ago and you guys have been loving it! When I first made it, it was actually for this cocktail and I had tons of leftovers. I couldn’t get over how flavorful it was but that since it was homemade, it didn’t have to be overly spiced, which is my main dislike over pumpkin spice flavored things. The days we were making these bourbon smashes, I couldn’t believe that I was still pregnant and wasn’t able to consume one or two like everyone else. So jealous, because they were the best. 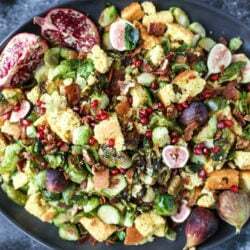 While I adore this idea for a Friendsgiving gathering, I do think it’s tricky to make a large serving at once. Like a pitcher of these could be doable for a gathering of four or six, but if you’re looking for a make-ahead cocktail that can serve more, I’d do something like this cider beer sangria, apple cider sangria or pomegranate punch! Those things hold up super well when made ahead of time. And now I’m dying to know what you’re doing for Friendsgiving and what sort of cocktails you are serving?! I also love this idea because it’s not only fun for a party, it’s something you most likely won’t make on a random Saturday night for yourself. But grab a few friends and you’re good to go! Annnnd. It’s over ice. It’s not frozen or creamy or ice-cream like. Even better. I mean, if it was up to me I think we’d all consume our pie in cocktail form. Heat the sugar, water, pumpkin puree and pie spice in a saucepan over medium-low heat. Whisk constantly until the sugar dissolves and let the mixture come to a simmer. Remove it from the heat and let it cool slightly, then add the vanilla extract. Strain it through a fine mesh strainer so you’re left with a syrup consistency. This can be kept in a sealed container in the fridge for a week or so! 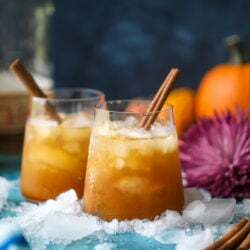 Fill a chilled glass with crushed ice and add the pumpkin syrup and bitters over top. Pour in the bourbon and garnish with a cinnamon stick. Serve! Or at least with pie on the side. Always. This sounds incredible! And it is SO pretty! I love the color! This looks and sounds wonderful! Great cocktail idea for Thanksgiving! Ooh this is going to be my 40th bday cocktail tonight! Eeep. I have also been very into Pumpkin this year even though I’m usually not. This looks perfect for thanksgiving! This is everything I’ve ever wanted! Ooh yes! My husband made something similar to this for our Friendsgiving last year, and it was a hit! I love the idea of using real pumpkin in cocktails — makes them seem healthier somehow LOL! Great recipe! I love the glassware? Where is it from? This is the best place and portal for online funny quotes and lessons.